This post is reprinted with permission from our friends at ProudCity. The new Guide to Buying Government Websites empowers local government leaders to make holistic, intelligent decisions when it comes to procuring quality online services needed to best serve increasingly digitally-centered communities. 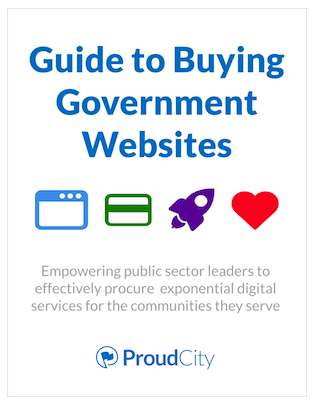 The Guide to Buying Government Websites, paired with Government Website Procurement Template, provides an accessible foundation for all stakeholders — city managers, mayors, council members, technologists, communicators, directors and other staff — to align on principles, purpose and approach so that the best decisions can be made that serve the needs of everyone. Use this guide to unify your team and start your digital modernization efforts with the confidence of an expert. You’ll make a smarter decision, have a much better final product, and your communities will thank you. Get started.